Canadian diplomats in Saudi Arabia appear to have misjudged the outcome and the potential magnitude of a death sentence handed down in 2014 against a prominent Shia cleric, whose execution over the weekend has sparked a crisis in the Middle East. 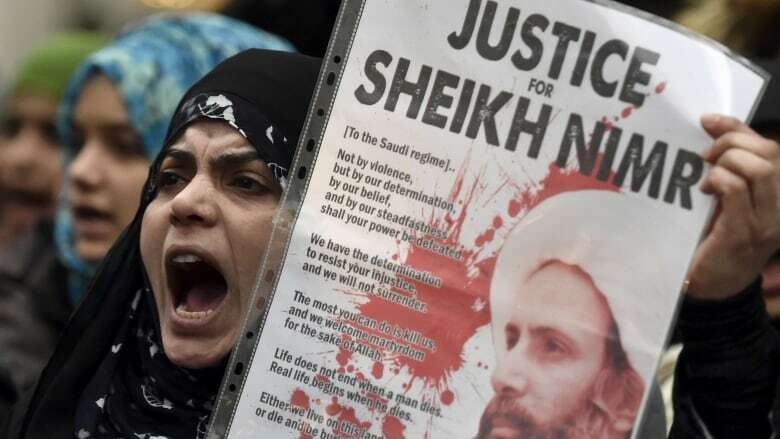 Saudi Arabia's embassy in Iran was attacked and set on fire by angry Shia demonstrators following the execution of Sheik Nimr al-Nimr over the weekend. On Monday, tensions escalated further as Saudi Arabia also suspended trade and travel between the two countries, and as Saudi allies followed suit by breaking or downgrading ties with Tehran. Documents obtained by CBC News show that officials at Canada's embassy in Riyadh were following the al-Nimr case closely at the time of his sentencing in October 2014. The documents suggest Canadian diplomats believed Saudi authorities were likely bluffing and would not actually carry out the death sentence. They also appear to have underestimated the scale of the reaction to the execution. Conservative global affairs critic Tony Clement said Monday that the killing of al-Nimr "is contrary to political and basic human rights" and called "on the Canadian government to raise these issues with the Saudi government at the first opportunity." But the documents, obtained through Access to Information, show that the federal government did not consider the execution likely to proceed and that Canadian diplomats recommended not taking any actions on the file when the sentence was first handed down in October 2014. John Baird, the Conservative foreign minister at the time, was in Saudi Arabia the morning after al-Nimr's sentencing and met with Crown Prince Salman bin Abdulaziz Al Saud. After the meeting, Baird issued a communiqué praising recent improvements in Saudi human rights and "encouraged continued progress in this positive direction." The same week, the Canadian Embassy in Riyadh was advising Ottawa that "bloggers and others remain hopeful that the death sentence will not be carried out." The report suggested Saudi authorities would be unlikely to ignore the repercussions overseas if such a high-profile execution went ahead. "In the past," reads the report, "Saudi authorities seemingly sentenced Shia opponents to death, only to later cancel the decisions as part of a give-and-take negotiation with the opposition or to underscore to the international community the checks and balances in the legal system and the independence of the judiciary." Events of the past few days have shown that this case would end very differently, and that Saudi authorities were less concerned with international reaction than Canadian officials had believed. The 2014 report also seems to underestimate the fallout from an execution, which has been swift and heavy. It suggests that al-Nimr's popularity "has decreased in past years as his strident views no longer fully represent" the Shia community, and that his following does not extend much beyond his hometown of Al Awamiyah in eastern Saudi Arabia. In fact, his execution has sparked mass protests throughout the Shia world, including Iran, Iraq and Yemen. "Even were the death sentence against Nimr al-Nimr to be executed, subsequent protests could be contained by the strong Saudi presence in the region, and the production of oil in the strategic Eastern Provinces would likely be impacted modestly, in a worst-case scenario." The report mentions the possibility of protests in Bahrain, and a fuelling of regional sectarian tensions, but does not consider the possibility of a major regional confrontation of the kind that has actually occurred. Always in the background is Canada's biggest-ever arms deal, a $14.8-billion contract for London, Ont.-based General Dynamics Canada to supply the kingdom with light armoured vehicles. That deal was announced several months before the al-Nimr sentencing, and represented 95 per cent of all Canadian military sales that year. No vehicles have yet been delivered under the contract. The contract has come in for increasing criticism, as it seems to have bypassed a Canadian law that prohibits arms sales to countries "with a persistent record of serious violations of the human rights of their citizens," unless Canada first obtains assurances that the weapons will not be used against the countries' civilians. Several observers reported seeing armoured vehicles similar to the ones the Saudis are buying from Canada on the streets of Bahrain after the Saudi army crossed the causeway between the two countries to help Bahrain's Sunni royal family suppress protests by the country's Shia majority. The suppression of those protests caused dozens of civilian deaths. CBC News asked the Department of Global Affairs for comment Monday, but did not receive a specific response. In a press release issued Monday morning, Foreign Affairs Minister Stéphane Dion condemned the execution of 47 individuals, including al-Nimr, on Jan. 2, expressing concern that it could further inflame sectarian tensions. "The Government of Canada raises concerns about human rights and due process with senior Saudi Arabian officials on a regular basis and will continue to do so," the release said.